Recently when I was investigating ultra-lightweight and portable tripods I came across the Tamrac ZipShot. This tripod is one of the most innovative, lightweight tripod designs to hit the market in some time. 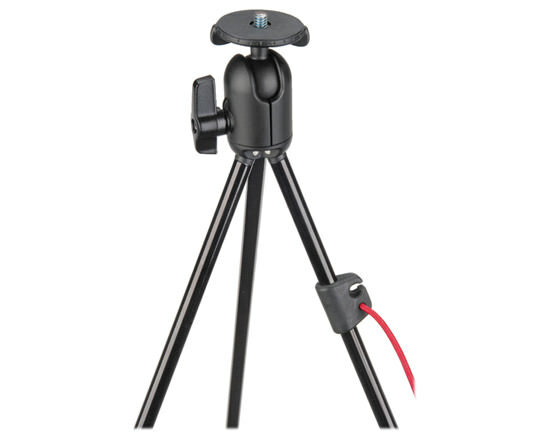 The tripod comes in two sizes: the TR404 mini which extends to 28” in height, weighs 9 ounces and folds up to 9” in length. The larger model is the TR406 which extends to about 44” in height, weighs 11 ounces, and folds up to 15”. Both models are weight-rated by Tamrac to support 3 pounds. Obviously the MeFoto is much heavier duty, weight-rated for 17.6 pounds. I wanted to point this out right upfront so readers who may consider buying the Tamrac ZipShot do so with realistic expectations on its capabilities. The ZipShot is for VERY LIGHT DUTY use only. 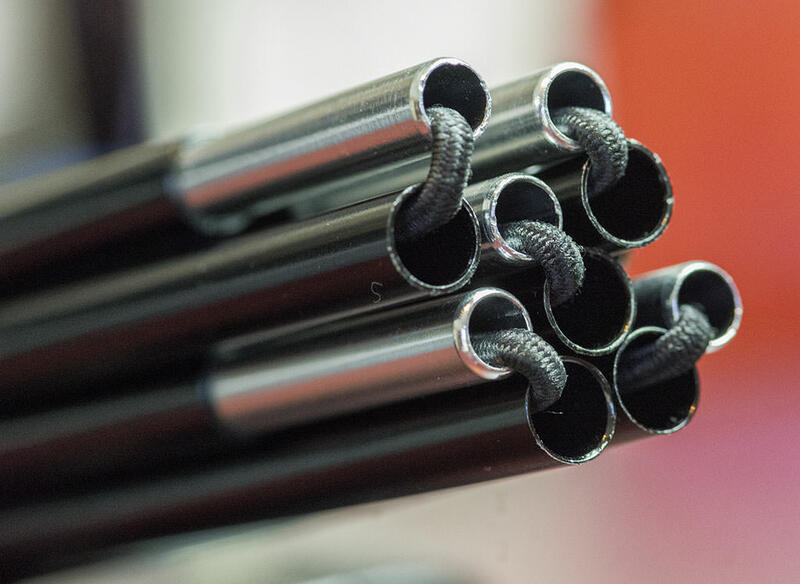 The legs of the ZipShot are made of ¼” aluminum tubes that are fastened together with elastic cables that run down inside the leg sections. When not in use the tripod leg sections fold up against each other and are fastened together with a couple of small bungee-style cords that clip into a pair of small plastic mounts. As the YouTube video above demonstrates, set-up is incredibly easy (scroll to 1:30-2:00 in the video to see set-up and pack-up). 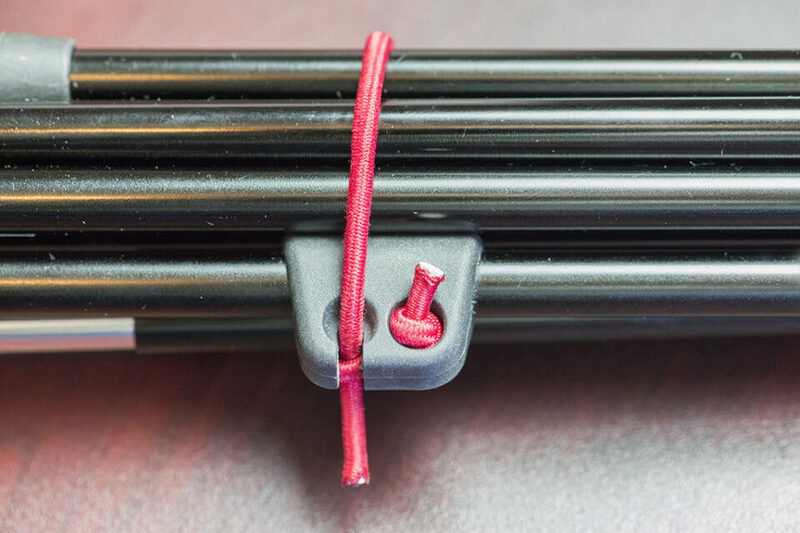 All you do is undo the two bungee fasteners, grab the tripod by the built-in ball head and let the leg sections drop. The internal elastic cables pull the various leg sections together. Then all you have to do is spread the legs until they fit snuggly against the underside of the built-in ball head, and affix your camera to the built-in ball head. Packing up the ZipShot is just as easy. Simply pick it up and pull the leg sections together, then by starting at the end with the rubber feet pull each section apart, then fold it over until it is totally collapsed. Use two bungee-style cords to fasten it. 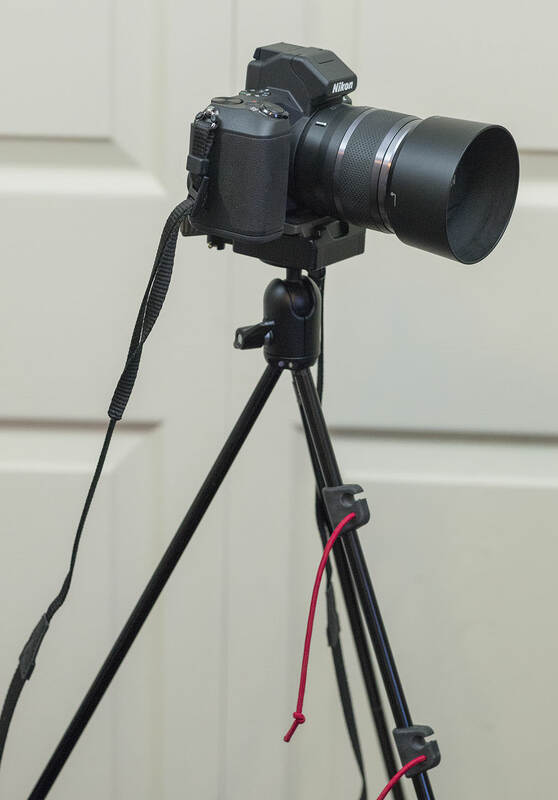 If you attach a Manfrotto or Arca-Swiss quick release plate to the built-in ball head, this tripod can be set-up and have a camera mounted on it in about 10-15 seconds. The ZipShot is perfect for people who put a higher value on portability than on functionality, and will appeal to street photographers, travelers, hikers, backpackers, campers, and extreme sports enthusiasts. But, this ultra-portability does come with some obvious compromises. 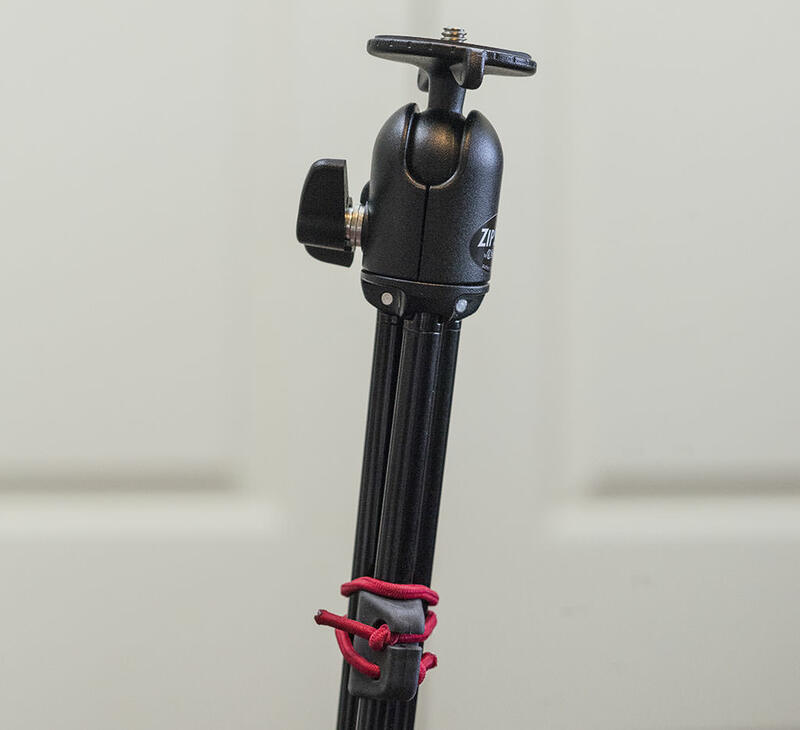 First, the tripod is not adjustable as there is no centre column and the elastic-cable-connected legs don’t allow for any adjustment either. The ball head is quite small with a single tightening adjustment. Given the design of the ZipShot it is best suited to very lightweight gear like point-and-shoots, bridge cameras, and small format interchangeable lens systems like the Nikon 1. 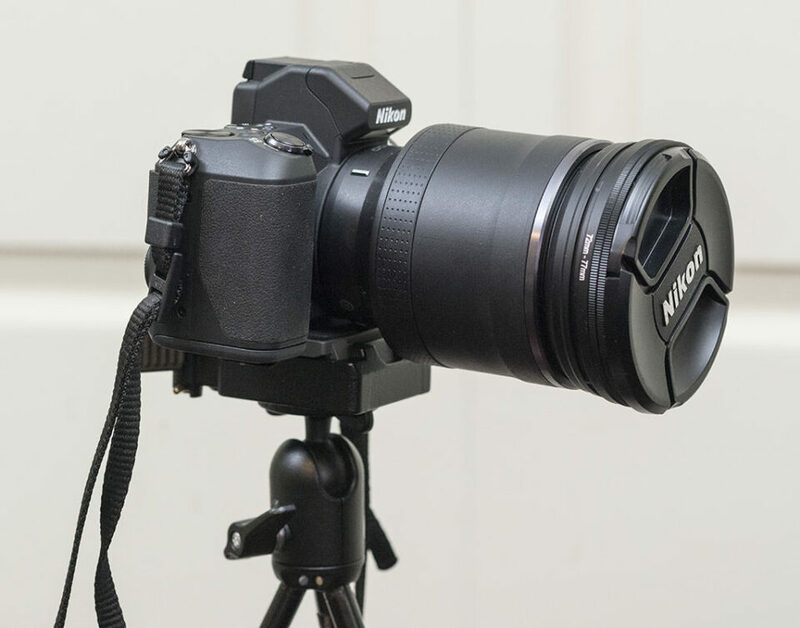 In a pinch you can mount a 4/3rd body and small lens, or a lighter weight DSLR with a small lens on the Zipshot. You should expect to use a remote shutter release or the self-timer on your camera with a minimum of a 2-second delay once you press the shutter. For heavier DSLR cameras you will likely need to use a 10-second delay or a remote shutter release. Remember to lock up the mirror on your DSLR for best results. I tried to mount my Nikon D800 with my 24-85 f/3.5-4/5VR lens on the ZipShot. This combination comes in right at the maximum weight rating for the unit at 3 pounds. The tripod and ball head held it…barely. It was extremely top heavy and quite unstable. It was also very difficult to get proper image framing as the ball head seemed to have a mind of its own when trying to hold this amount of weight. Would I risk this kind of camera gear on at ZipShot? Not a chance. Next, I put a Nikon 1 V2 with the large 1 Nikon 10-100 PD zoom on it. This combination weighs in at about 1.75 pounds (approx. 800 grams), which is well under the stated maximum capacity of the Zipshot. I found that this set-up was also quite unstable on the ZipShot because the 10-100 PD lens extends forward when operating and creates a weight imbalance over the centre of the ball head. I tried a number of times and could not get a steady shot when trying long exposures due to tripod shake. Just pushing down manually on the shutter of the V2 was sufficient to cause a fair amount of tripod shake. Even a 2-second time delay on the shutter was insufficiently long to allow the ZipShot time to settle down. I had to set the V2 for a 10-second shutter delay in order to get a clear shot at slow shutter speeds. But, it did work. Finally I tried the V2 with each of the small 1 Nikon kit zoom lenses (10-30mm and 30-110mm) on it. Both of these lenses when mounted on the V2 create a total weight load of one pound or less, I found that this was a much more practical load for the ZipShot. It appeared to be stable enough that I would feel comfortable setting up a group people shot, pressing the shutter with a delay, and then getting into the shot without worrying about the camera and lens falling over. Even when using these small, lightweight kit zoom lenses with the V2, I still found it difficult to get clear shots with the ZipShot when shooting at slow shutter speeds. As was the case with a heavier load, any downward pressure on the camera shutter would cause some slight vibration to resonate through the tripod. This caused noticeable image blur on long exposures. Using a remote shutter release or setting the camera with a shutter delay is definitely needed when using the ZipShot for these kinds of shots. Cameras that can activate the shutter via a rear touch screen may fare better. Another good tripod test is to use it to capture a spread of exposures in order to create an HDR image. I tried this with a Nikon 1 V2 and the 6.7-13 VR lens. I used a 2-second shutter delay for each shot, taking the first at standard exposure, then doing one at +3 and the last at -3 (note this needs to be done manually on the Nikon 1 V2). I found that the ZipShot did a credible job and my HDR software (Photomatix) had no difficulty working with the files. Since I was shooting in bright sunlight a 2-second time delay was sufficient to ensure sharp exposures for use in an HDR composite image. The final question I had was whether the Tamrac ZipShot could be used with a lightweight video head like the Manfrotto 391RC2 to shoot basic video pans or tilts. So I tried it out with the Nikon 1 V2 and 10-30 kit lens. This set-up weighs about 2 pounds. With a lot of patience and care I got a few very slow pans to work at an acceptable level, but tilts were so-so at best. From a practical standpoint the Tamrac ZipShot should be used for still images only. The Nikon 1 V3 has a new movie e-VR stabilization feature that is designed to assist with hand-held video. I haven’t received my V3 yet and I don’t know how well that feature works. If it enables effective video capture with the Tamrac ZipShot when used with the Manfrotto 391RC2 it could open up some interesting options for travelers, hikers, etc. Once the ZipShot’s legs are extended you can wrap them with the fastening bungees and create a 48” monopod. 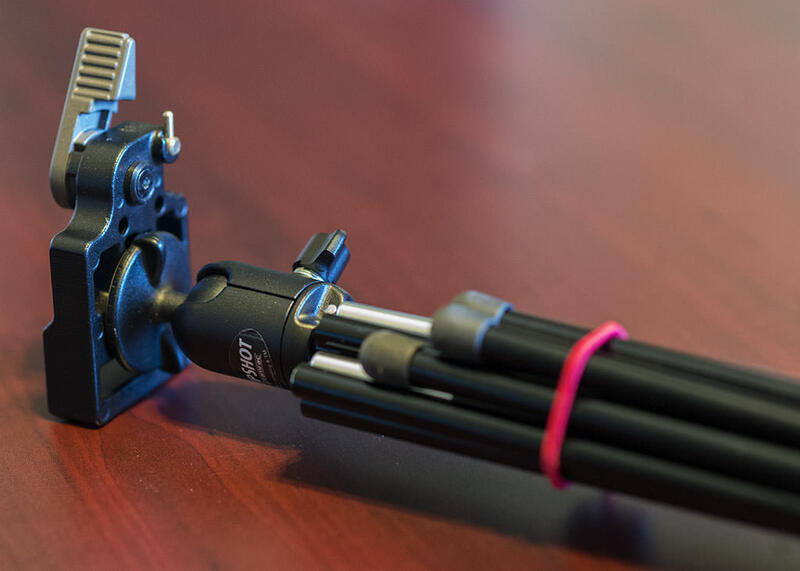 When used in this configuration, if you lightly hold the ZipShot just under its ball head with your thumb and index finger, you can use it as a crude, and only partially effective, camera stabilizer. This might come in handy if you want to walk while shooting video. Remember to keep your shooting arm extended and your knees bent as you walk. Take slow, heel-to-toe steps to help minimize camera bobbing and shake. It won’t replace a proper camera stabilizer but it’s better than nothing if you find yourself in a bind. We’ve all heard the old saying, “The best camera is the one you have with you.” The same can be said for tripods. For some shots where a slow shutter speed is required you simply need to have a tripod with you to capture it. Even with all of its limitations the Tamrac ZipShot tripod could be very useful for many photographers who need an ultra-lightweight and portable tripod that they can use in a pinch. Only use appropriately sized cameras with the ZipShot like point-and-shoots, compact bridge, and small interchangeable lens camera systems like the Nikon 1 series. 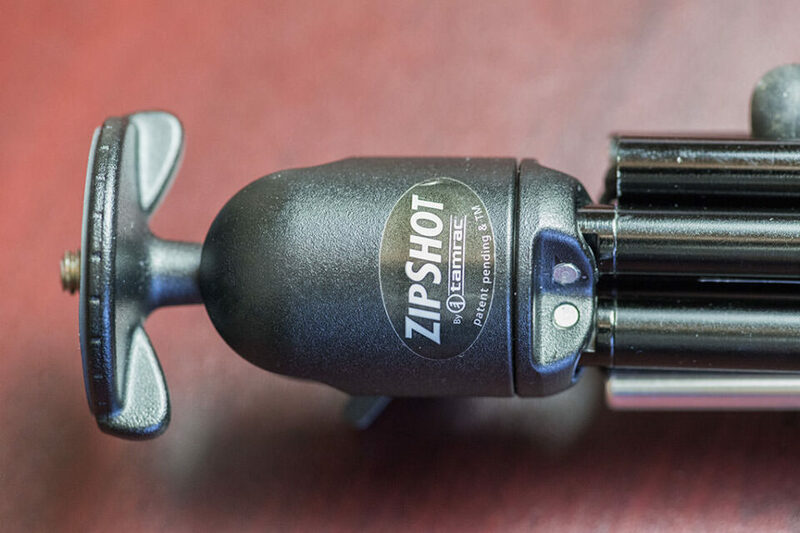 Try and keep the total load on the ZipShot to 1 pound or less. Avoid using long, heavy lenses. Attach a Manfrotto or Arca-Swiss quick release plate to the ZipShot to make camera set-up faster. (Tamrac makes a quick release attachment for the ZipShot but if you own any tripod heads now you’re likely already have Manfrotto or Arca-Swiss plates anyway). Make sure the tripod legs are spread to the maximum so they fit snuggly into the base of the ball head for best stability. Never try to get more height from the ZipShot by not spreading the legs fully. This will cause the ball head to wobble. Never hang your camera bag from the ZipShot to try and stabilize it. The tripod is not made to handle that much weight and you could damage it. If you follow these simple guidelines you’ll find that the Tamrac ZipShot can be a very useful addition to your kit. 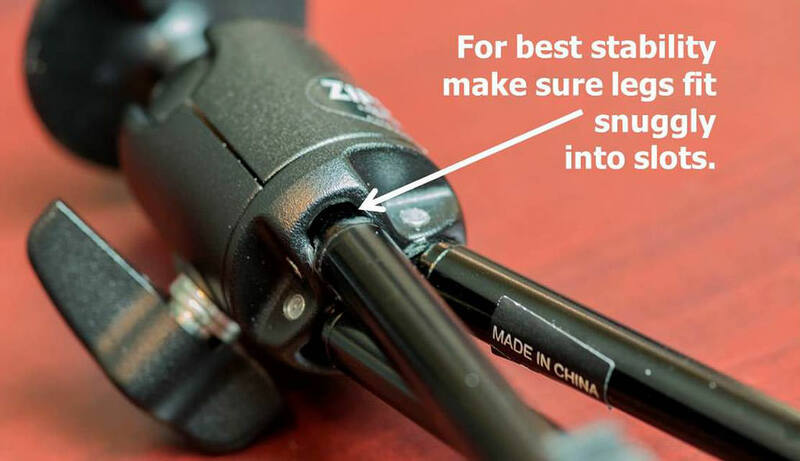 But, remember that due to its limited functionality the ZipShot will never replace a more traditional tripod. Copyright 2014 Thomas Stirr. All rights reserved, no use or reproduction of any kind allowed without permission. Used with permission by Photography Life. Thanks for the review, Thomas. I agree with you wholeheartedly. I tried a ZipShot a year or two ago, and decided to return it. Your comments about it being good for very light cameras is spot on. I would never put a DSLR on it, and I would probably not use it for a heavier P&S like a Canon G1X. For smaller cameras, such as a Canon S100, it would probably work. But, for those smaller cameras, I find that the Manfrotto table top tripod (or similar ones from Oben or other manufacturers) is small, easy to carry, and stable. Still, the design of the ZipShot (similar to camping tent poles), makes using it a snap. Thanks very much for your comment on the ZipShot. LIke any piece of gear as long as we understand its limitations we can make a logical decision whether it would make sense for us or not. One of the only advantages that the ZipShot has over a table top tripod is its height (i.e. 44″)…I think some of the tabletop models likely have a bit more stability. I’ll have a look at the Manfrotto and Oben offerings you mention in your post. Tom, You’re right about the height of the Manfrotto/Oben/etc. tabletop tripod. They are quite short, but in my experience, can be fairly stable. I have even used them with a D610 and 50mm f/1.8g. The shortness of this tripod has forced me to be more creative with my shots, which is always a good thing. While you can’t use it everywhere, something very handy to keep in the bag when travelling w/o tripod is a Manfrotto Superclamp with small ball head. If/when you can find something solid to clamp it to (and that is not always an option, of course), it provides a very solid platform for even a dSLR and tele-zoom. Done it many times. Great idea! I think a lot of people would love to have some of these small camera supports in their camera bag. I went on the B&H web site and found the Manfrotto Super Clamp with a small head offered as a kit. Cool! Most of us have an extra ball head lying around too, which works also. As I said, you need something to clamp to, but sometimes it’s better than a tripod, and more stealthy. Cheers. I recently bought a Sirui T-025X, for international travel, and while it’s a little pricey at $240 www.adorama.com/SIBSR…kbid=65109, I like it a lot. I especially like its telescoping center column which can be left on for height or completely removed to get really low to the ground. Thanks for your comment and sharing the link. I had a look at the Sirui….looks like a very nice tripod. It would certainly be a lot more functional than the ZipShot and has a better load capacity…..but then it costs 5x more. Hey nice report about an interesting product. Just one criticism. Please add metric measures to the article. I know it’s an American webpage. But here are many International readers. Most of the world is metric only America and some dictatorships still use Imperial units. Thanks, BTW I love that webpage. Great article, very honest with a true representation of the product. Even small cameras can become unstable in the wind with this tripod. Nothing is inexpensive, even a V2 with a lens is close to $1000.00. Why anyone would want to put a camera with a cost like that on this tripod is beyond me no matter how portable and terrific it might seem for travel. I really like your articles and if you have some time hop over to my blog as well at www.elliotpaulstern.me where I would like to repost some of your articles if that is allowed. I am new here and have not quite read all the rules. Thank you for your comments…very much appreciated. 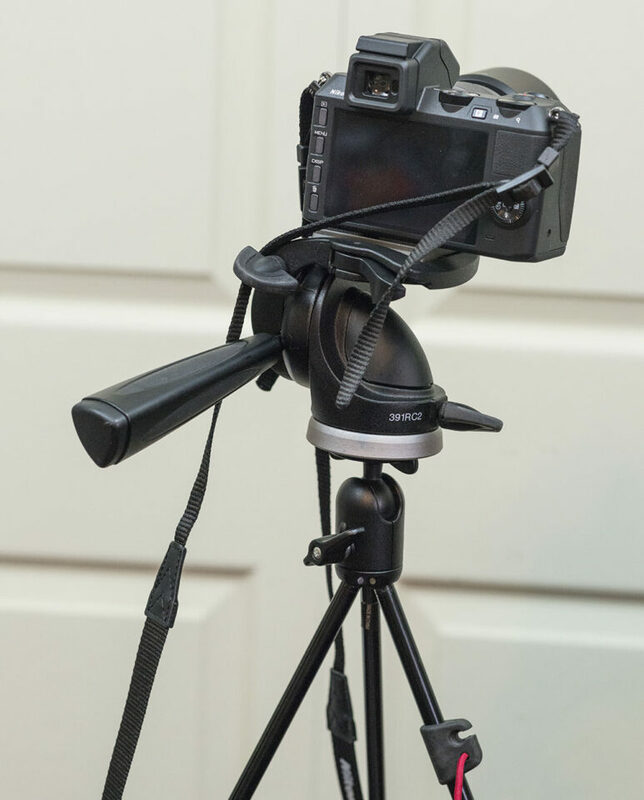 I agree that the MeFoto is a much more robust, flexible and appropriate travel tripod. I would only trust my Nikon 1 on the ZipShot if it was on flat terrain, with no wind…and with a lightweight 1 Nikon lens mounted on it. As far as reposting any of my articles, as long as you give me full copyright notice and also note my website, and my YouTube channel, I would not have any problem with you reposting. I maintain copyrights for all articles that I write regardless of where they appear. It would also be appreciated if you mentioned that the article appeared on Photography Life, and show an appropriate link….or you may simply want to have a link from your blog directly to the articles here. As far as articles written by other resident members of Photography Life and other article posters on this site you would need to contact the authors individually. I am in and out of cell service at the moment but would like to talk to you as well. Thanks for the quick response. I have no problems with anything you asked for and it would be my pleasure. I write a lot but it is human nature for readers to want to here other opinions and ideas and I would be more than happy and excited to send them your way. Hopefully I’ll pick up a cell tower somewhere in these hills. Flooding in lot’s of areas here in the North East US has caused wireless and cell outages from place to place. travel … travel … travel …. for long exposures, etc. 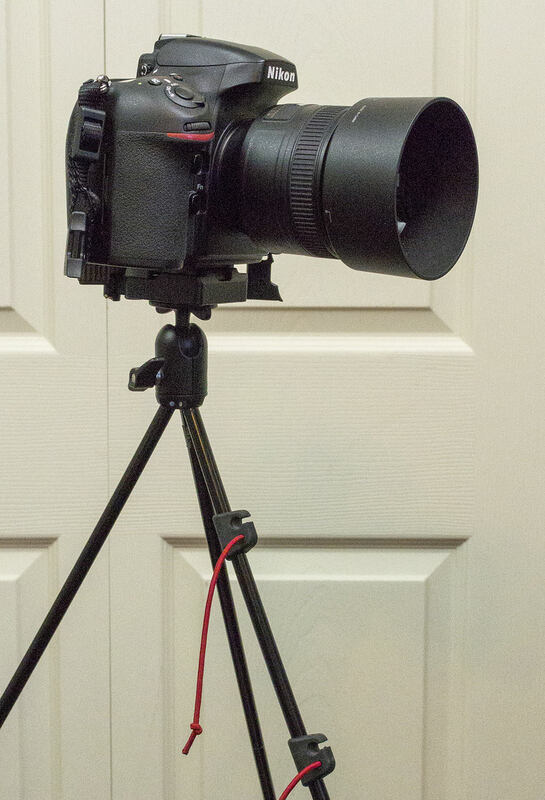 – when you can’t take a normal tripod with you due to space or weight limitations. As long as you use the tripod within its weight limitations it can come in handy. This is a long shot, seeing as how this article is pretty old now. For the Mefoto tripod, I cannot get the head to come off for the life of me. I assume it simply unscrews from the center pole, but it is so solid and unable to twist that I must be missing something. Can anyone advise?! Thanks!